There are colossal reasons for these four Nifty stocks to lead the market and lead from the front .Because after a prolonged consolidation the Indian equity markets are raging bulls and investors are pouring in funds generously than ever before , Nifty is on a new highs, and these four idiots are sure to double in the next 42 months . 1) Hindalco:- Finally the aluminium prices have started crawling up , as LME aluminium has increased to 20% during the past quarter and it only goes to indicate that the signs are positive for the company and the upward cycle has begun. And also the global automobile manufacturers are preferring the much lighter aluminium over steel to meet the stricter emission laws and also pressure is to improve the fuel efficiency .Novelis is the subsidiary of Hindalco which is going to benefit the most due to the great timing of the company’s auto grade capacity expansions underway, and Novelis accounts for 66% of Hindalco’s revenues. With these changes in the scenario the company sniffs 15% operating profit growth in the next three and a half years and in addition to the deleveraging process will only add to benefit to the net profit levels because even the interest too will start slipping down . And if we keenly observe the Novelis’s stock is trading at much lower multiples than its competitors and this gap is headed to reduce contributing to more than double of the Hindalco stocks. 2) ONGC:- The Oil and Natural Gas Corporation is state run and currently contributes to 28% of the total under-recoveries in the Indian petroleum sector which totaled a grande Rs56,384 crore in last financial year .As the diesel prices deregulated this company is bound to be benefitted the most due to the reduced burden of the subsidies, even more so the company is heavily investing and focusing upon expansions which will help in clocking well above 20% to its current output and the direct beneficiaries will be its subsidiaries like ONGC Videsh and MRPL and the news is the three mega project in downstream industries ONGC Petro-additions ,ONGC Mangalore Petrochemicals and ONGC Tripura Power will very shortly be commissioned which will trigger the super duper returns !!! 3) Maruti Suzuki:-This is one Indian automobile company which has made its mark right from its day one and left its foot marks and there is no stopping it , with all state of art indigenous parts , this company promises to keep its dominating nature going on and on .This company is looking forward to multiple trigger the operational as well as its financial performances. It’s all new mid segment sedan ciaz has hit the bulls eye after few haywire hits and trials in this segment and it is definitely going to get immensely benefitted by the pent up demand in passenger car sales in the coming decade more so because the company has always lived up more to its expectations .Besides ciaz the company is also planning to launch five diesel variants soon .Besides the Maruti car is always any Indian’s first car and the company enjoys its strong portfolio and its products are well regarded for the low cost ownership and the very vast dealers and service center network and it is headed to eat into the major market share with its firm domestic growing sales volumes and to add to it its vigorous exports strategy .So Maruti company is marching ahead and has a looong way to go . 4) Bharat Petroleum:- Bharat Petroleum is India’s Oil marketing company and the company’s market capitalization has excelled well over 2.5 times and still there is ample potential of growth . As there is a very steady growth in the book value of the company and hence the company’s value will be around Rs38,785 crores, as the company is currently trading at a price to book value in the multiple of 2.5 times and the and the price to earnings ratio of 11 and further more the company’s Current accounts and savings accounts (CAGR)over the next three years is bound to reduce the subsidies and lower the interest costs. 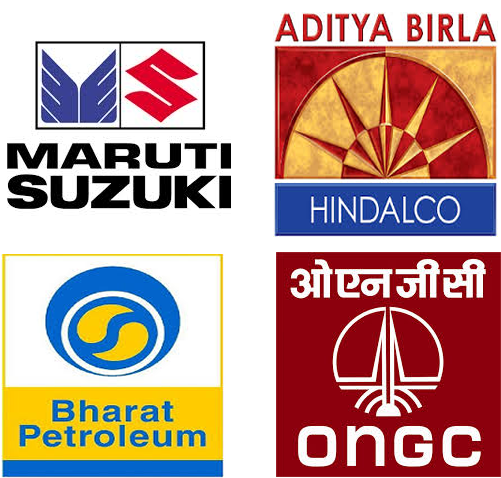 And another feather in the hat is that Bharat Petroleum has its investments in listed companies like Oil India,Indraprast Gas and Petronet LNG which is currently valued at Rs3,600 crores . And with its E&P projects in Brazil and Mozambique will be commissioned soon and this will take the company ahead by leaps and bounds.